Sunday's picture poser was Garry Kasparov scowling through Mikhail Tal's cigarette smoke. Congratulations to all who got it right including Ryan Emmet, chessloser and Prashant Jambunathan. The game, a super sharp Semi-Slav Botvinnik Variation, was played at the Spartakiade in the summer of 1983. Today's picture from the September 1983 issue of Chess Magazine shows a different view of the same encounter. Their headline: "What a game!". The Spartakiade was held in the interval between Garry Kasparov's Candidates match win over Alexander Beliavsky and his on-off-on Candidates encounter with Viktor Korchnoi. 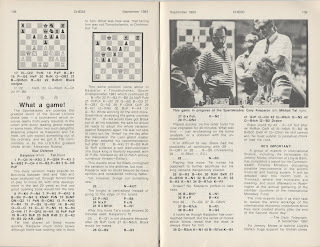 Click on the image to read Alex Roshal's notes to this fabulous game; you can also play through the moves online.